Download "Guide to Planning Permission and Building Regulations for Householders Adverts and Signs Planning Permission Building Regulations"
1 Guide to and for Householders Please note that this is an informal guide to planning permission and building regulations for householders. Questions regarding specific situations or applications should be dealt with by your local planning authority. Please check with your local authority before starting any work. Adverts and Signs Planning permission is not normally required for a small sign, for instance with your house name or number on it. You may need to apply for advertisement consent to display an advertisement bigger than 0.3 square metres, however, and the planning regime for larger, professional adverts, signs for businesses and so on is complex. Domestic adverts and signs are not normally subject to building control though, if lit, any electrical work would be. In all cases they must 'be kept in a safe condition'. Air Source Heat Pump The planning regime covering air source heat pumps is currently being revised. Installing an air source heat pump will become permitted development as soon as standards and safeguards have been established to deal with noise. Until then planning permission may be necessary and you are advised to contact your local planning authority for guidance. If you live in a listed building or a conservation area you should also contact your council to check on local policy. Building regulations will normally apply to installing an air source heat pump. It is advisable to contact an engineer who can provide the necessary advice. Air source heat pumps transfer heat from the air into a building to provide electric heating that generates hot water which can be used for space heating and/or hot water. Bathroom Planning permission is not normally required for maintenance/replacement of bathrooms though if you live in a listed building you should check with your Local Planning Authority. If you want to install fittings such as a bath, WC, shower or washbasin within your home, or any other type of building, the will apply. will also apply if the work involves installing an additional fitting or fittings. If you want to install, or replace your bath with, a whirlpool or spa bath, the may apply. If you are renovating a bathroom think about the amount of water you are going to use. Biomass Fuelled Appliances Planning permission is not normally needed when installing a biomass system in a house if the work is all internal. If the installation requires a flue outside, however, it will normally be permitted development if the relevant conditions are met. Building regulations apply. You should take into account factors such as ventilation, noise and general safety. Installation should be carried out by a suitably qualified installer. Building regulations also apply to other aspects of the work such as electrical installation and plumbing work. Producing energy from biomass is a carbon neutral process and has both environmental and economic advantages. 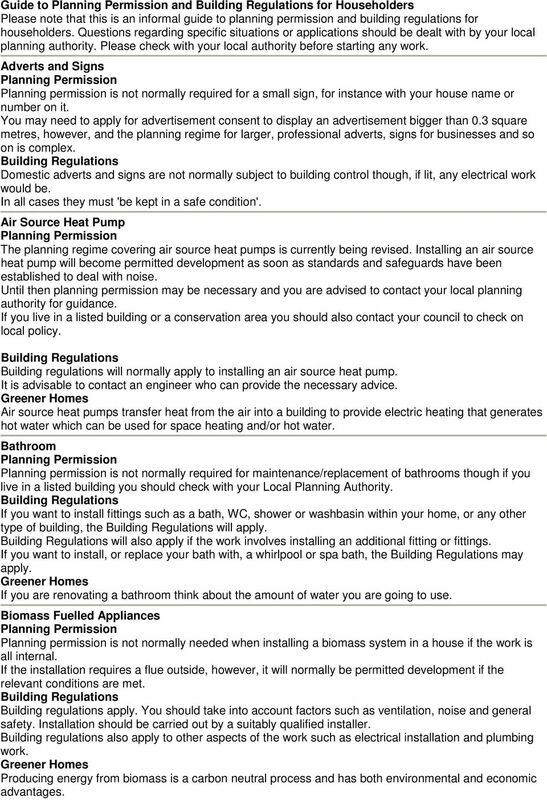 2 Boilers and Heating Planning permission is not normally required for installation or replacement of a boiler though if you live in a listed building you should check with your Local Planning Authority. will apply if you want to: Install or replace a hot water cylinder Install, replace or alter the position of any type of gas, solid fuel and oil appliances (including boilers) Install a fixed, flueless, gas appliance However, if you employ a registered installer with the relevant competencies to carry out the work on gas appliances, they should be able to self-certify the work without the need for close involvement of Building Control. Using a high efficiency boiler could save you money and significantly cut your home s CO2 emissions. Ceilings Planning permission Planning permission is not normally required for maintenance of ceilings though if you live in a listed building you should check with your Local Planning Authority. Where more than 25 per cent of a ceiling below a cold loft space or flat roof is being replaced then the would normally apply, and the thermal insulation of that ceiling would normally have to be improved. 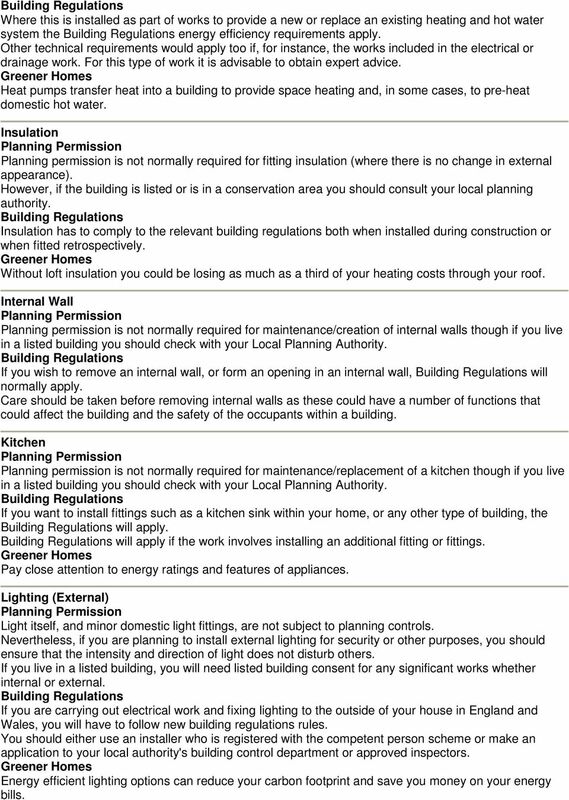 Circuits / Electrics Planning permission is not normally required for maintenance/installation of electrics though if you live in a listed building you should check with your Local Planning Authority. If you are carrying out electrical work in your home or garden in England and Wales, you will have to follow new rules in the. You should use an installer who is registered with a competent person scheme or seek approval from a Building Control Body. This is true for most work. However, you do not need to tell them about repairs, replacements and maintenance work or extra power points or lighting points or other alterations to existing circuits (except in a kitchen or bathroom, or outdoors). Conservatories A conservatory is treated exactly the same as any other extension under planning regulations, regardless of the materials used. From 1 October 2008 new rules apply to whether or not you can extend or add to your house without having to apply for planning permission. The new limits and conditions for what is allowed without the need for planning permission apply largely to the dimensions of the proposed addition, its position on the house and its proximity to your boundaries. A conservatory built with a floor area of no more than 30m2 is normally exempt from the Building Regulations, provided that: 1. At least half of the new wall and three quarters of the roof is constructed from translucent material, e.g. glazing; 2. The conservatory is separated from the building by external quality doors, windows and walls; 3. Any glazing and fixed electrical installation complies with the applicable requirements of the (i.e. Part N Glazing and Part P - Electrical Safety ). Any new structural opening or the increased width of the original opening between the conservatory and the existing house will require approval. 3 A badly designed conservatory can be a huge energy drain for the house as a whole. Decking Putting up decking, or other raised platforms, in your garden is permitted development providing: they are no more than 30cm above the ground together with other extensions, outbuildings etc, they cover no more than 50 per cent of the garden area. 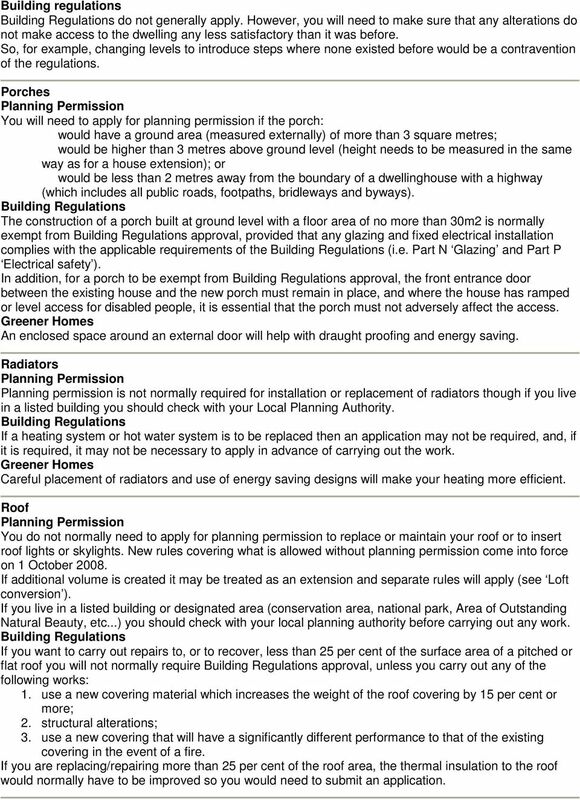 Building regulations should be assumed to apply to every deck structure requiring planning permission. 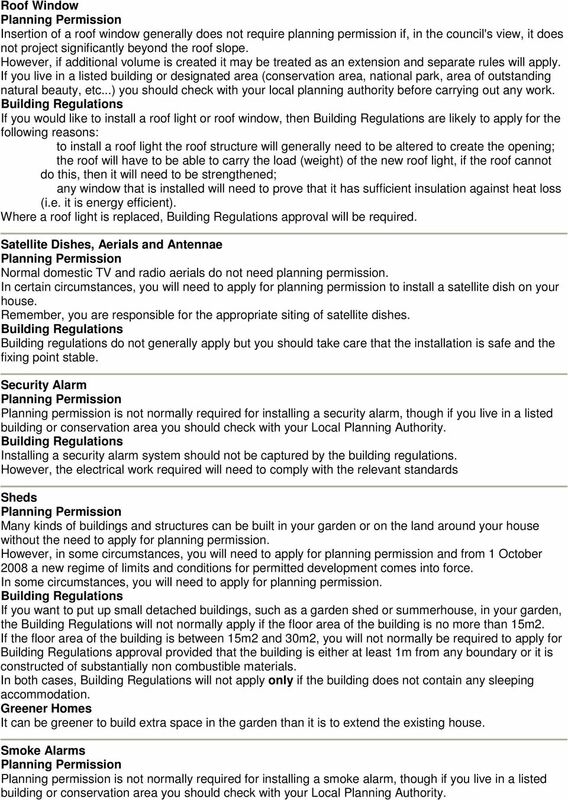 If you are unsure about whether you are required to comply, you may wish to contact your local Building Control body. Decoration Planning permission is not normally required for internal decorations though if you live in a listed building you should check with your Local Planning Authority. Any internal decorating such as wallpapering, new skirting boards or painting will not require a Building Regulations application. Dormer Window Whether or not you need planning permission for a dormer window or roof extension depends on a number of factors outlined in loft conversion advice. Building regulations approval is required to convert a loft or attic into a liveable space. 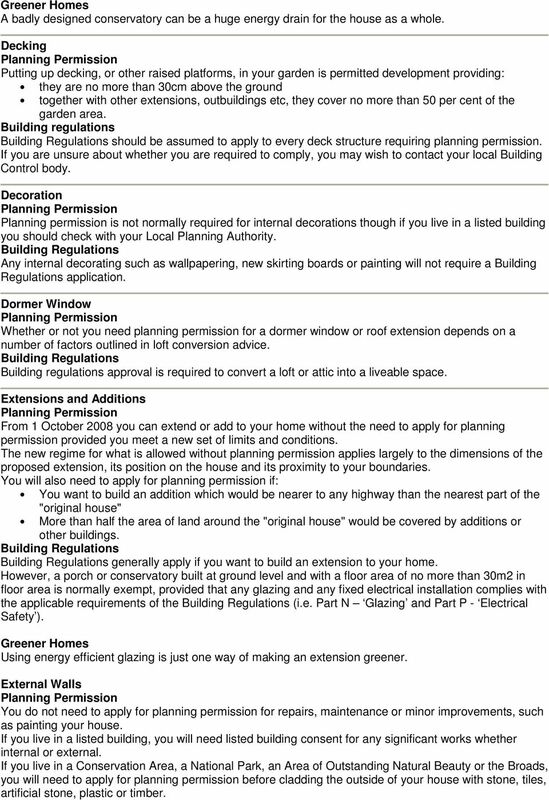 Extensions and Additions From 1 October 2008 you can extend or add to your home without the need to apply for planning permission provided you meet a new set of limits and conditions. The new regime for what is allowed without planning permission applies largely to the dimensions of the proposed extension, its position on the house and its proximity to your boundaries. You will also need to apply for planning permission if: You want to build an addition which would be nearer to any highway than the nearest part of the "original house" More than half the area of land around the "original house" would be covered by additions or other buildings. generally apply if you want to build an extension to your home. However, a porch or conservatory built at ground level and with a floor area of no more than 30m2 in floor area is normally exempt, provided that any glazing and any fixed electrical installation complies with the applicable requirements of the (i.e. Part N Glazing and Part P - Electrical Safety ). Using energy efficient glazing is just one way of making an extension greener. External Walls You do not need to apply for planning permission for repairs, maintenance or minor improvements, such as painting your house. If you live in a listed building, you will need listed building consent for any significant works whether internal or external. If you live in a Conservation Area, a National Park, an Area of Outstanding Natural Beauty or the Broads, you will need to apply for planning permission before cladding the outside of your house with stone, tiles, artificial stone, plastic or timber. 4 If you want to re-render or replace timber cladding to external walls, the may apply depending on the extent of the work. Where 25 per cent or more of an external wall is re-rendered, re-clad, re-plastered or re-lined internally or where 25 per cent or more of the external leaf of a wall is rebuilt, the Regulations would normally apply and the thermal insulation would normally have to be improved. If you want to insert insulation into a cavity wall the Regulations will apply. The appropriate requirements will be applied to ensure the insulation material is suitable, and that in the case of some foam insulants the risk of formaldehyde gas emission is assessed. If you have cavity walls it s usually worth exploring getting insulation installed within the cavity. Fascia Maintenance of the fascia such as replacement or painting generally does not require planning permission. However, if you live in a listed building or designated area (conservation area, national park, area of outstanding natural beauty, etc...) you should check with your local planning authority before carrying out any work. The replacement of any fascia board or soffit will not normally require a application to be submitted. If the existing system had vents installed then this will need to be maintained as they provide ventilation to the roof. Fences, Walls and Gates You will need to apply for planning permission if you wish to erect or add to a fence, wall or gate and: it would be over 1 metre high and next to a highway used by vehicles (or the footpath of such a highway); or over 2 metres high elsewhere; or your right to put up or alter fences, walls and gates is removed by an article 4 direction or a planning condition; or your house is a listed building or in the curtilage of a listed building. the fence, wall or gate, or any other boundary involved, forms a boundary with a neighbouring listed building or its curtilage. Fences, walls and gates do not require building regulation approval. However, the structures must be structurally sound and maintained. If the garden wall is classes as a 'party fence wall' then you may have to notify the adjoining owner. 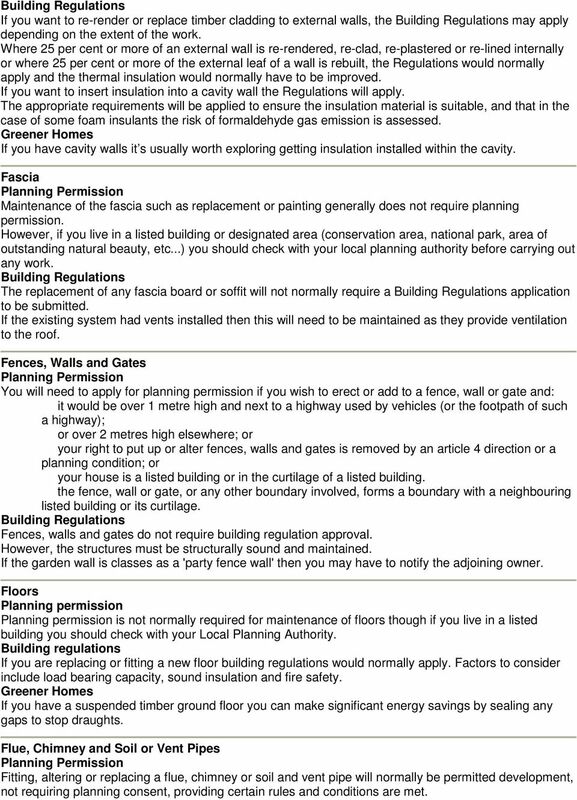 Floors Planning permission Planning permission is not normally required for maintenance of floors though if you live in a listed building you should check with your Local Planning Authority. Building regulations If you are replacing or fitting a new floor building regulations would normally apply. Factors to consider include load bearing capacity, sound insulation and fire safety. If you have a suspended timber ground floor you can make significant energy savings by sealing any gaps to stop draughts. Flue, Chimney and Soil or Vent Pipes Fitting, altering or replacing a flue, chimney or soil and vent pipe will normally be permitted development, not requiring planning consent, providing certain rules and conditions are met. 5 Part J of the seeks to ensure, among other things, that there is adequate provision for the discharge of the products of combustion to the outside air through flues that create enough draught, can take the expected temperatures, are sufficiently gas tight,and discharge at locations away from openings into the building. Flues and chimneys should be fixed in appropriate places. Ventilation pipes should finish at least 900mm above any opening into the building within three metres. Fuel Tanks Small domestic fuel tanks can normally be installed without planning permission. However, permission will be required in certain circumstances. From 1 October 2008 permitted developments rights which apply for oil storage will include liquid petroleum gas. If you live in a listed building you should check with your Local Planning Authority. The installation of a fuel tank should meet the necessary building regulations requirements. If the installation is above ground the requirements will be applied to achieve adequate shielding of the tank from any surrounding fire and containment of any leakage. Garages Garages can be built in your garden or on the land around your house without the need to apply for planning permission. However, permission will be required in certain circumstances. If you live in a listed building you should check with your Local Planning Authority. Construction of a garage attached to an existing home will normally require approval. The construction of an attached carport (open on at least two sides) would not normally require approval if it has a floor area of no more than 30m2 (except in respect of electrical installations). The construction of a detached garage would not normally require approval (except in respect of electrical installations), if: 1. the floor area is no more than 15m2; or 2. the floor area is between 15m2 and 30m2 and the garage is at least one metre from any boundary, or is constructed from substantially non-combustible materials. Converting any garage into habitable use will normally require approval. Ground Source Heat Pump Installing a ground source heat pump system does not usually need planning permission. If you live in a listed building or a conservation area, however, you should contact your council to check on local policy. Building regulations apply. Installation should be carried out by a suitably qualified installer. The equipment, installation and testing of the system must all comply with relevant standards detailed in the 'Low or Zero Carbon Energy Sources: Strategic Guide (LZC)' and 'Domestic Heating Compliance Guide'. 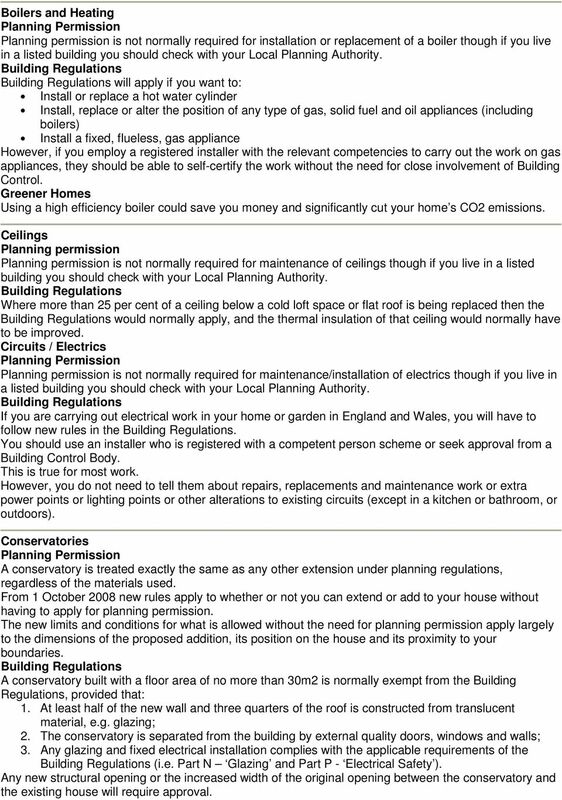 Building regulations also apply to other aspects of the work such as electrical installation and plumbing. Ground source heat pumps (GSHP) transfer heat from the ground into a building to provide space heating and, in some cases, to pre-heat domestic hot water. 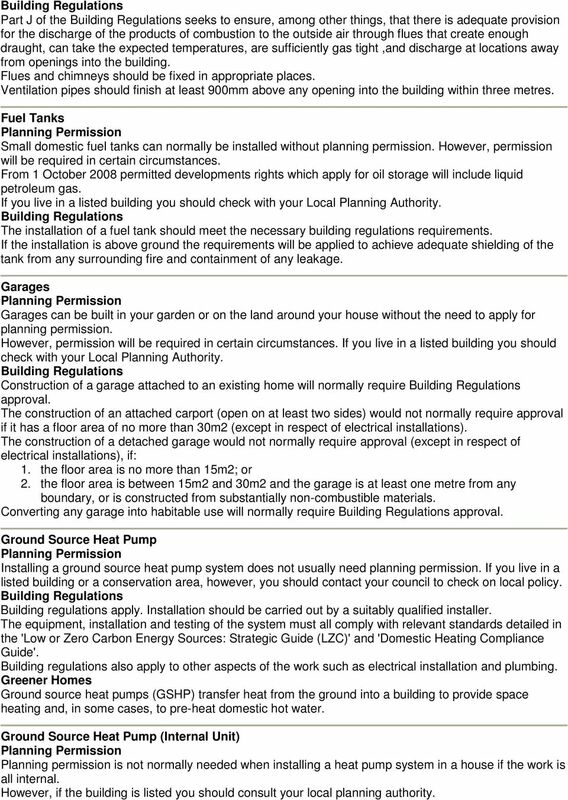 Ground Source Heat Pump (Internal Unit) Planning permission is not normally needed when installing a heat pump system in a house if the work is all internal. However, if the building is listed you should consult your local planning authority. 6 Where this is installed as part of works to provide a new or replace an existing heating and hot water system the energy efficiency requirements apply. Other technical requirements would apply too if, for instance, the works included in the electrical or drainage work. For this type of work it is advisable to obtain expert advice. Heat pumps transfer heat into a building to provide space heating and, in some cases, to pre-heat domestic hot water. Insulation Planning permission is not normally required for fitting insulation (where there is no change in external appearance). However, if the building is listed or is in a conservation area you should consult your local planning authority. Insulation has to comply to the relevant building regulations both when installed during construction or when fitted retrospectively. Without loft insulation you could be losing as much as a third of your heating costs through your roof. Internal Wall Planning permission is not normally required for maintenance/creation of internal walls though if you live in a listed building you should check with your Local Planning Authority. If you wish to remove an internal wall, or form an opening in an internal wall, will normally apply. Care should be taken before removing internal walls as these could have a number of functions that could affect the building and the safety of the occupants within a building. Kitchen Planning permission is not normally required for maintenance/replacement of a kitchen though if you live in a listed building you should check with your Local Planning Authority. If you want to install fittings such as a kitchen sink within your home, or any other type of building, the will apply. will apply if the work involves installing an additional fitting or fittings. Pay close attention to energy ratings and features of appliances. Lighting (External) Light itself, and minor domestic light fittings, are not subject to planning controls. Nevertheless, if you are planning to install external lighting for security or other purposes, you should ensure that the intensity and direction of light does not disturb others. If you live in a listed building, you will need listed building consent for any significant works whether internal or external. If you are carrying out electrical work and fixing lighting to the outside of your house in England and Wales, you will have to follow new building regulations rules. You should either use an installer who is registered with the competent person scheme or make an application to your local authority's building control department or approved inspectors. Energy efficient lighting options can reduce your carbon footprint and save you money on your energy bills. 7 Lighting (Internal) Light itself, and minor domestic light fittings, are not subject to planning controls. Nevertheless, if you are planning to install external lighting for security or other purposes, you should ensure that the intensity and direction of light does not disturb others. If you live in a listed building, you will need listed building consent for any significant works whether internal or external. If you are carrying out electrical work and installing lighting in your house then will apply. However, repairs, replacements and maintenance work or extra lighting points or other alterations to existing circuits (except in a kitchen or bathroom, or outdoors) is allowed. Energy efficient lighting options can reduce your carbon footprint and save you money on your energy bills. Loft Conversion Planning permission is not normally required. However, permission is required where you extend the roof space and it exceeds specified limits and conditions. From 1 October 2008 new rules apply to whether or not you need to apply for planning permission to convert or alter your loft space. Buildings Regulations apply if you want to carry out a loft conversion to your home. The appropriate requirements of the regulations will be applied to ensure, for example: the structural strength of the new floor is sufficient; the stability of the structure (including the existing roof) is not endangered; safe escape from fire; safely designed stairs to the new floor; and reasonable sound insulation between the conversion and the rooms below. You will also need to consider whether your loft conversion project is subject to The Party Wall etc. Act 1996 under which you must give adjoining owners notice. Maintaining Drainpipes You do not usually need to apply for planning permission for repairs or maintenance. Occasionally, you may need to apply for planning permission for some of these works because your council has made an Article 4 Direction withdrawing permitted development rights. 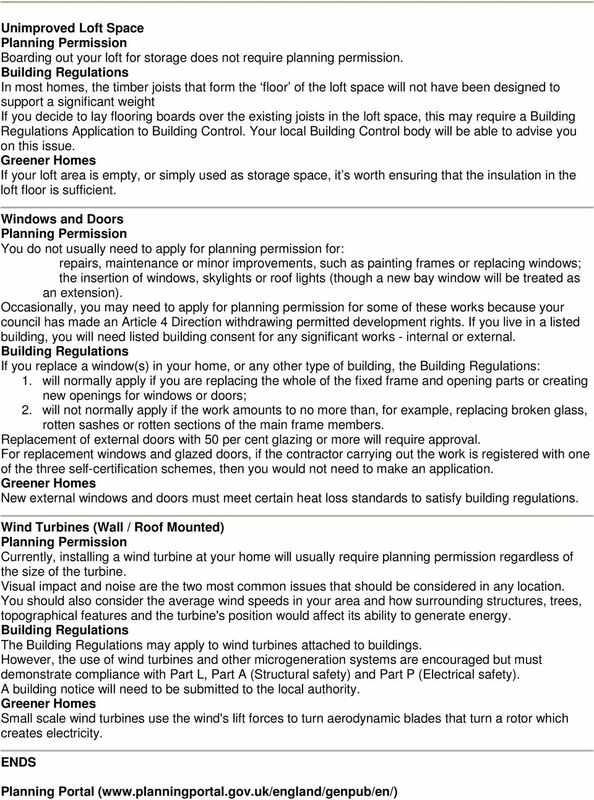 Soil and vent pipe will also normally be permitted development providing certain rules and conditions are met. If you live in a listed building, you will need listed building consent for any significant works whether internal or external. If you wish to repair or replace an existing drainpipe, manhole or associated fitting, approval under the is not normally required if the replacement is like for like. However, the provision of a new drainpipe, manhole or associated fitting will normally require approval under the. They will apply to new rainwater or foul drains inside as well as outside the building. The Building Regulations also apply to all non-mains foul sewerage arrangements (i.e. those using septic tanks), including their outlets and drainage fields. Ventilation pipes should finish at least 900mm above any opening into the building within three metres. Manhole and Drains Although the work itself may not require planning permission you should clarify ownership and responsibility before modifying or carrying out maintenance. Drains, sewers and manholes may be shared with neighbours or owned by the relevant water authority. Failure to confirm these details or to comply with relevant standards/legislation could lead to legal and remedial action at your own cost. 8 If you wish to repair or replace an existing drainpipe, manhole or associated fitting, approval under the is not normally required if the replacement is like for like. However, the provision of a new drainpipe, manhole or associated fitting will normally require approval under the. They will apply to new rainwater or foul drains inside as well as outside the building. The also apply to all non-mains foul sewerage arrangements (i.e. those using septic tanks), including their outlets and drainage fields. Micro-Combined Heat and Power Planning permission is not normally needed when installing a micro-chp system in a house if the work is all internal. If the installation requires a flue outside, however, it will normally be permitted development if the relevant conditions are met. The equipment, installation and testing of a micro-chp system must all comply with relevant standards set out in full in the 'Low or Zero Carbon Energy Sources: Strategic Guide (LZC)'. 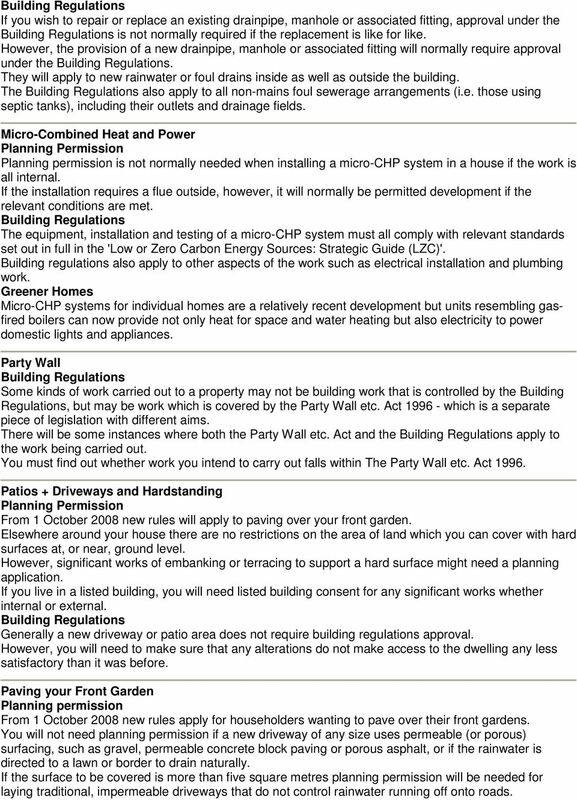 Building regulations also apply to other aspects of the work such as electrical installation and plumbing work. Micro-CHP systems for individual homes are a relatively recent development but units resembling gasfired boilers can now provide not only heat for space and water heating but also electricity to power domestic lights and appliances. Party Wall Some kinds of work carried out to a property may not be building work that is controlled by the Building Regulations, but may be work which is covered by the Party Wall etc. Act which is a separate piece of legislation with different aims. There will be some instances where both the Party Wall etc. Act and the apply to the work being carried out. You must find out whether work you intend to carry out falls within The Party Wall etc. Act Patios + Driveways and Hardstanding From 1 October 2008 new rules will apply to paving over your front garden. Elsewhere around your house there are no restrictions on the area of land which you can cover with hard surfaces at, or near, ground level. However, significant works of embanking or terracing to support a hard surface might need a planning application. If you live in a listed building, you will need listed building consent for any significant works whether internal or external. Generally a new driveway or patio area does not require building regulations approval. However, you will need to make sure that any alterations do not make access to the dwelling any less satisfactory than it was before. Paving your Front Garden Planning permission From 1 October 2008 new rules apply for householders wanting to pave over their front gardens. You will not need planning permission if a new driveway of any size uses permeable (or porous) surfacing, such as gravel, permeable concrete block paving or porous asphalt, or if the rainwater is directed to a lawn or border to drain naturally. If the surface to be covered is more than five square metres planning permission will be needed for laying traditional, impermeable driveways that do not control rainwater running off onto roads. 9 Building regulations do not generally apply. However, you will need to make sure that any alterations do not make access to the dwelling any less satisfactory than it was before. So, for example, changing levels to introduce steps where none existed before would be a contravention of the regulations. Porches You will need to apply for planning permission if the porch: would have a ground area (measured externally) of more than 3 square metres; would be higher than 3 metres above ground level (height needs to be measured in the same way as for a house extension); or would be less than 2 metres away from the boundary of a dwellinghouse with a highway (which includes all public roads, footpaths, bridleways and byways). The construction of a porch built at ground level with a floor area of no more than 30m2 is normally exempt from approval, provided that any glazing and fixed electrical installation complies with the applicable requirements of the (i.e. Part N Glazing and Part P Electrical safety ). In addition, for a porch to be exempt from approval, the front entrance door between the existing house and the new porch must remain in place, and where the house has ramped or level access for disabled people, it is essential that the porch must not adversely affect the access. An enclosed space around an external door will help with draught proofing and energy saving. Radiators Planning permission is not normally required for installation or replacement of radiators though if you live in a listed building you should check with your Local Planning Authority. If a heating system or hot water system is to be replaced then an application may not be required, and, if it is required, it may not be necessary to apply in advance of carrying out the work. Careful placement of radiators and use of energy saving designs will make your heating more efficient. Roof You do not normally need to apply for planning permission to replace or maintain your roof or to insert roof lights or skylights. New rules covering what is allowed without planning permission come into force on 1 October If additional volume is created it may be treated as an extension and separate rules will apply (see Loft conversion ). If you live in a listed building or designated area (conservation area, national park, Area of Outstanding Natural Beauty, etc...) you should check with your local planning authority before carrying out any work. If you want to carry out repairs to, or to recover, less than 25 per cent of the surface area of a pitched or flat roof you will not normally require approval, unless you carry out any of the following works: 1. use a new covering material which increases the weight of the roof covering by 15 per cent or more; 2. structural alterations; 3. use a new covering that will have a significantly different performance to that of the existing covering in the event of a fire. If you are replacing/repairing more than 25 per cent of the roof area, the thermal insulation to the roof would normally have to be improved so you would need to submit an application. 10 Roof Window Insertion of a roof window generally does not require planning permission if, in the council's view, it does not project significantly beyond the roof slope. However, if additional volume is created it may be treated as an extension and separate rules will apply. If you live in a listed building or designated area (conservation area, national park, area of outstanding natural beauty, etc...) you should check with your local planning authority before carrying out any work. If you would like to install a roof light or roof window, then are likely to apply for the following reasons: to install a roof light the roof structure will generally need to be altered to create the opening; the roof will have to be able to carry the load (weight) of the new roof light, if the roof cannot do this, then it will need to be strengthened; any window that is installed will need to prove that it has sufficient insulation against heat loss (i.e. it is energy efficient). Where a roof light is replaced, approval will be required. Satellite Dishes, Aerials and Antennae Normal domestic TV and radio aerials do not need planning permission. In certain circumstances, you will need to apply for planning permission to install a satellite dish on your house. Remember, you are responsible for the appropriate siting of satellite dishes. Building regulations do not generally apply but you should take care that the installation is safe and the fixing point stable. Security Alarm Planning permission is not normally required for installing a security alarm, though if you live in a listed building or conservation area you should check with your Local Planning Authority. Installing a security alarm system should not be captured by the building regulations. However, the electrical work required will need to comply with the relevant standards Sheds Many kinds of buildings and structures can be built in your garden or on the land around your house without the need to apply for planning permission. However, in some circumstances, you will need to apply for planning permission and from 1 October 2008 a new regime of limits and conditions for permitted development comes into force. In some circumstances, you will need to apply for planning permission. If you want to put up small detached buildings, such as a garden shed or summerhouse, in your garden, the will not normally apply if the floor area of the building is no more than 15m2. If the floor area of the building is between 15m2 and 30m2, you will not normally be required to apply for approval provided that the building is either at least 1m from any boundary or it is constructed of substantially non combustible materials. In both cases, will not apply only if the building does not contain any sleeping accommodation. It can be greener to build extra space in the garden than it is to extend the existing house. Smoke Alarms Planning permission is not normally required for installing a smoke alarm, though if you live in a listed building or conservation area you should check with your Local Planning Authority. 11 Building regulations If you are building a loft conversion, extension or altering the layout of your home building regulations (Part B Fire Safety) would normally apply. now require the installation of automatic smoke detectors to all new dwellings and loft conversions. Advice should be taken on the type of smoke alarm(s) to be fitted, positioning and installation. 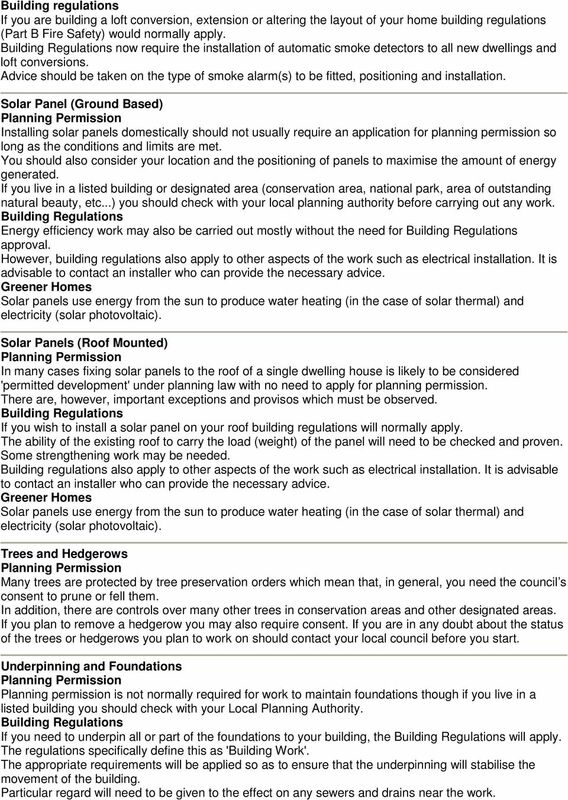 Solar Panel (Ground Based) Installing solar panels domestically should not usually require an application for planning permission so long as the conditions and limits are met. You should also consider your location and the positioning of panels to maximise the amount of energy generated. If you live in a listed building or designated area (conservation area, national park, area of outstanding natural beauty, etc...) you should check with your local planning authority before carrying out any work. Energy efficiency work may also be carried out mostly without the need for approval. However, building regulations also apply to other aspects of the work such as electrical installation. It is advisable to contact an installer who can provide the necessary advice. Solar panels use energy from the sun to produce water heating (in the case of solar thermal) and electricity (solar photovoltaic). Solar Panels (Roof Mounted) In many cases fixing solar panels to the roof of a single dwelling house is likely to be considered 'permitted development' under planning law with no need to apply for planning permission. There are, however, important exceptions and provisos which must be observed. If you wish to install a solar panel on your roof building regulations will normally apply. The ability of the existing roof to carry the load (weight) of the panel will need to be checked and proven. Some strengthening work may be needed. Building regulations also apply to other aspects of the work such as electrical installation. It is advisable to contact an installer who can provide the necessary advice. Solar panels use energy from the sun to produce water heating (in the case of solar thermal) and electricity (solar photovoltaic). Trees and Hedgerows Many trees are protected by tree preservation orders which mean that, in general, you need the council s consent to prune or fell them. In addition, there are controls over many other trees in conservation areas and other designated areas. If you plan to remove a hedgerow you may also require consent. If you are in any doubt about the status of the trees or hedgerows you plan to work on should contact your local council before you start. Underpinning and Foundations Planning permission is not normally required for work to maintain foundations though if you live in a listed building you should check with your Local Planning Authority. If you need to underpin all or part of the foundations to your building, the will apply. The regulations specifically define this as 'Building Work'. The appropriate requirements will be applied so as to ensure that the underpinning will stabilise the movement of the building. Particular regard will need to be given to the effect on any sewers and drains near the work. Housing Health and Safety Rating System Landlord s Risk Assessment Form Why use this form? The Housing Health and Safety Rating System is the method now used to assess the condition of private rented properties. Design Essentials Stockland Residential Communities 1 st January 2014 WELCOME TO THE DESIGN ESSENTIALS The Design Essentials form part of your Contract of Sale and assist when designing your home and landscape. St. Louis County Department of Public Works Division of Code Enforcement. 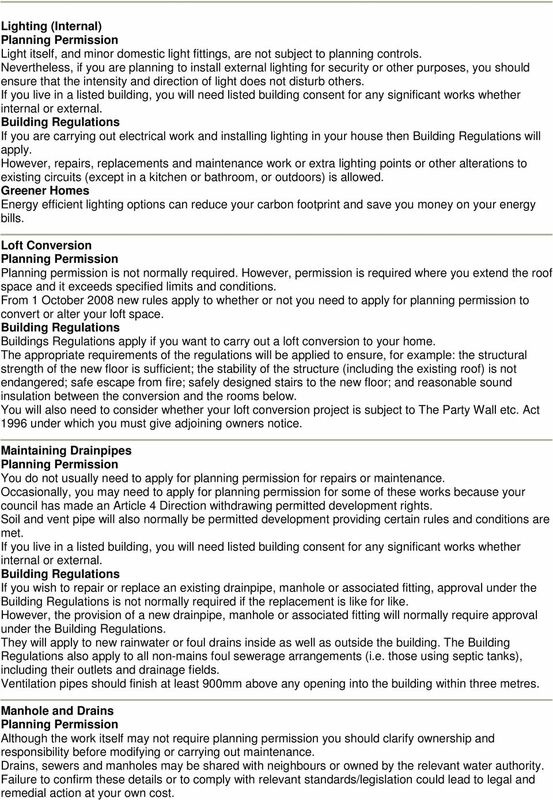 When is a Building Permit required for Residential Projects?